This project is a fork of RaspiDrums, my first real attempt to use the Raspberry Pi to create a drum module. In addition to massive improvements, the big difference between RapsiDrums and eXaDrums is that eXaDrums comes as a shared library (.so). That means that you can use the library in any of your projects really easily, thanks to the eXaDrums Api. Another big difference is that a graphical user interface (GUI) has been developed using Gtkmm 3. Any linux distribution that can handle Gtk can run the GUI, that includes Raspbian, and Ubuntu MATE on the Raspberry Pi. You can now use eXaDrums on your PC as well, as long as you're running a linux distribution (tested with (X)ubuntu, and Debian), and have a microntroller of some sort to send the sensors' data through the USB. So, in short, eXaDrums consists of two parts: a library that is (will be) providing a complete electronic drum kit, and a GUI that makes things pretty and easy to use. As you may have guessed already, the GUI is meant to be used with a touchscreen. I had this idea months ago, but I couldn't find a good touchscreen that wasn't using the Pi's GPIO. 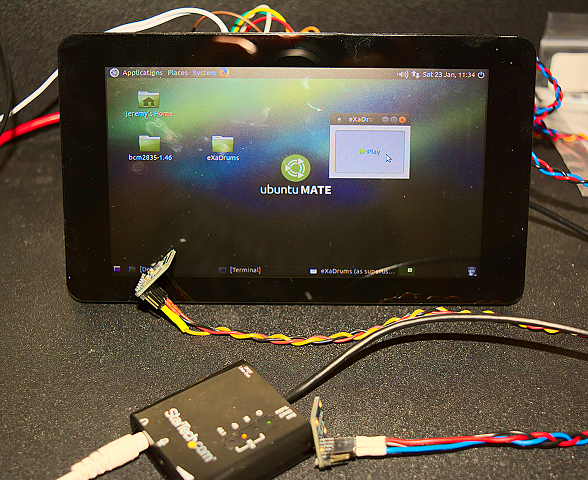 The Raspberry Pi foundation recently release the official Raspberry Pi touchscreen, and it uses the DSI port. So I got one, and started to develop the GUI, and now that I've read and tested Gtkmm quite a lot, I'm confident that the GUI of eXaDrums will be amazing. As the project goes, I intend to build a case for the touchscreen and acquisition board, as well as the full frame of the drum kit, including the drums and cymbals. We're not their yet, but this is clearly where I'm going. Check out the next sections to see some screen shots, demos, etc., and also learn more about the project. Photograph of the system: Raspberry Pi + touchscreen, soundcard, and two sensors are visible. The GUI is shown on the screen. As you can see, the GUI looks quite pretty when used with Ubuntu MATE (Raspberry Pi 2B). Let's start with the demos for a change! If you're running a Linux distribution on your PC/Laptop, or Raspberry Pi, you can install eXaDrums. To that end, you need to get both the source code of libeXaDrums, and eXaDrums (the GUI). In case you just want to see some demonstrations, you'll find some things below. 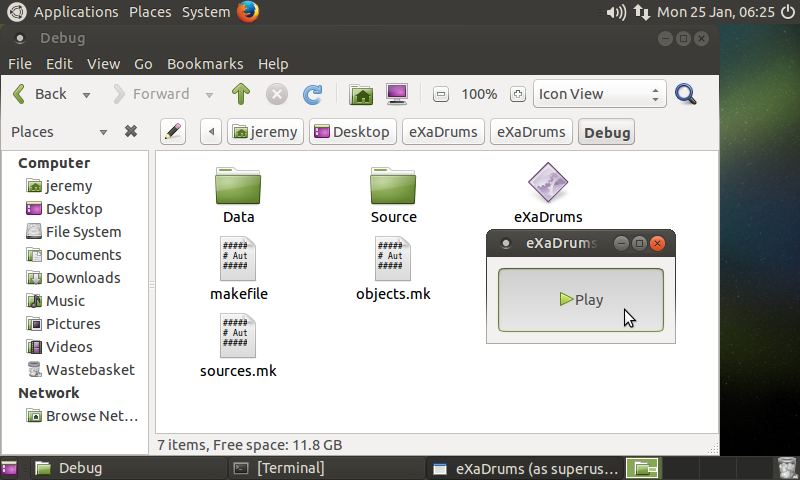 eXaDrums consists of a shared library (libeXaDrums), that contains the core of the software, and an executable (eXaDrums), that uses the library in order to display the GUI. You can download both libeXaDrums and eXaDrums from Github. The makefiles are included, so these programs are very easy to compile and use. For more information, read the next sections! 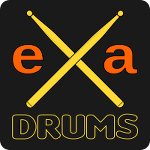 The eXaDrums library, or libeXaDrums, is a shared library (.so). It contains all the functions that are needed to run and control the drum module, kits manager, and more. As it will be explained in this section, if you can compile the library, it's really easy for you to use it in your own C++ program. Alternatively, you can replace the first line by cd Debug, to compile the debug version. The -j4 option specifies how many threads should be used to compile the project, if you have a dual core CPU, it's usually 4, if it's a quad core, it probably is 8. Now in the Release directory (or Debug if you built the debug version), you should see a file named libeXaDrums.so. That's the library that contains all the functions of the eXaDrums software. If you were able to compile the library, you can use it in your C++ programs. However, there are a few things that you need to know to use the library. These things are described below. Hdd: Recorded sensors values are read from a file (useful if you just want to test the software on your PC). Serial: Reads values from the serial input (for instance USB), so that you can use a microcontroller to send the sensors data to your computer (example: arduino, PIC32...). Once you've loaded the drum kit, it's pretty easy, you just need to use the start and stop functions of the Api: drumKit->Start(); starts the drum kit, and drumKit->Stop(); stops it. Because eXaDrums is a shared library, it's a lot easier to reuse in any other C++11 program. The Gui is also developed in C++11 and uses Gtkmm 3. That makes it compatible with a lot of linux distributions. And that's all you need. You can now compile the software. The executable file is then located in eXaDrums/Release. So far, the Gui is just a window with a button that starts and stops the drums. This section will be completed as the Gui evolves.